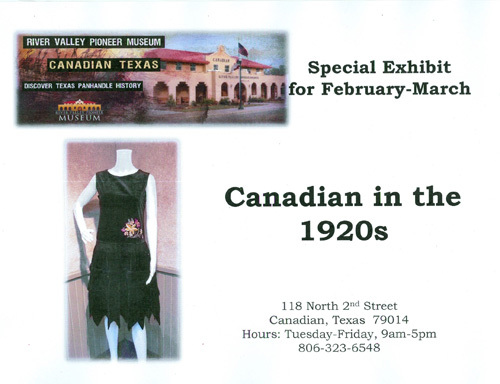 The museum’s special exhibit, “Canadian in the 1920s”, will be on display for the remainder of March. This exhibit covers the history of 1920s time period, fashion and hairstyles. Also displayed are beautiful dresses from the museum collection, belonging to area Canadian residents. 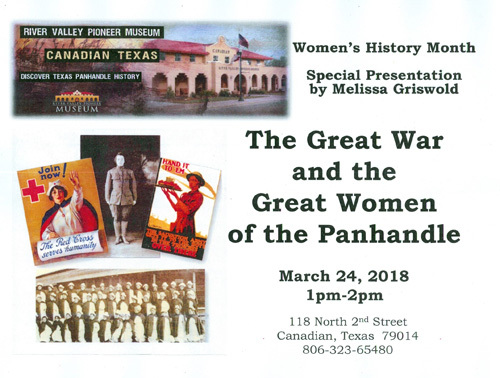 This Saturday, March 24th, the museum will host guest speaker, Melissa Griswold. Her topic will cover The Great War and the Great Women of the Panhandle. Melissa spoke last Veterans Day on the Great War; this is a second part to that earlier program. This event is free, beginning at 1:00pm and should last approximately an hour. Thank you to those that have responded to our membership drive, we appreciate your continued support. If you did not receive a membership packet, and would like one, let us know by email, rvmuseum@cebridge.net, or contact the office at 806-323-6548.